Whether you’re a newbie in the affiliate marketing world or already a consummated veteran, you probably heard, or used, a lot of pre-landers. If you check any forum thread, you’ll be able to understand people love talking about them all over the place. Let’s start dealing with this topic as we Academy Wicked Writers usually do. I’m gonna get real basic so you can follow from the get go. First, let’s determine what the heck is a lander! A lander is just the webpage that’ll appear when the user is directed to the offer. That’s where the user actually confirms their conversion. Now let’s understand what’s a pre-lander. Considering the prefix, you can already figure out what a pre-lander is all about, right? It’s a web page that comes before the actual landing page for the offer. The concept is clear now. But why do people use it? Isn’t it just another step before the conversion? But the thing is, people use pre-landers that help convince users, or predispose them to ultimately convert. That it’s gotta have content that engages the user. 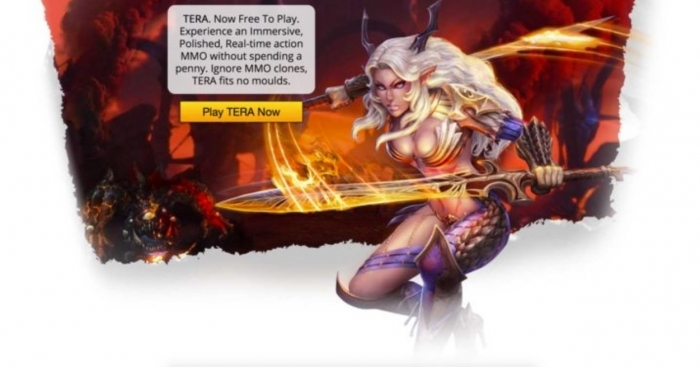 What kind of mobile pre-lander is more engaging? Well, this depends on many factors, such as the type of offer, the GEO and even smaller factors, like some colour or disposition in the pre-lander itself. That’s why media buyers usually test many mobile pre-landers by split testing when launching campaigns. In fact, they do this because they wanna see which ones perform better and then focus on those like real pros. It’s very important to mention that a mobile pre-lander doesn’t do everything. It’s still crucial to have a great banner that drives traffic to it (in the case of a display campaign) and a good offer that actually converts. Now you can boast about the fact that you’ve mastered two cool definitions. Let’s roll and explore the content! First of all, let’s check the most common characteristics of pretty much all types of pre-landers! They need a well-made, clear, and very explicit button that’ll guide users towards conversions. This part is especially true for dating offers. As the user answers some questions and goes on to the next step, they feel increasingly more engaged. 3 to 5 steps. It needs to be aesthetically cool. It’s gotta be something a user will land on and that’s gonna immediately spark interest. Because – in case it’s unappealing or bland – the user will simply close it and forget about it! Shady, shoddy, low-grade kind of inferiorly designed pre-landers usually make the campaign worse. If you can’t design to save your life you might as well stick with old school direct linking so you don’t embarrass yourself. The longer it takes for your pre-lander to load, the lower your CR will be. Don’t think about seconds, here. Now moving on to our list. One of the types of offer that’s super popular is sweepstakes offers. You know the ones, right? 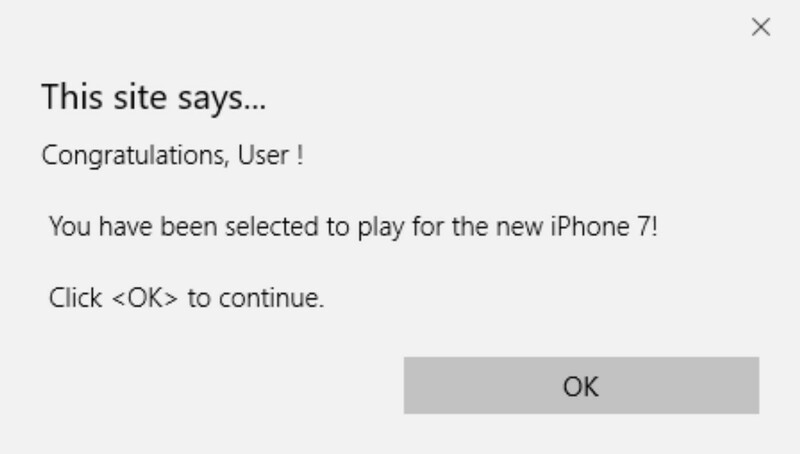 They’re those that make the user fill out a form in order to get the chance to win a certain prize, most likely an iPhone or something similar. This is a type in which pre-landers are very often used. 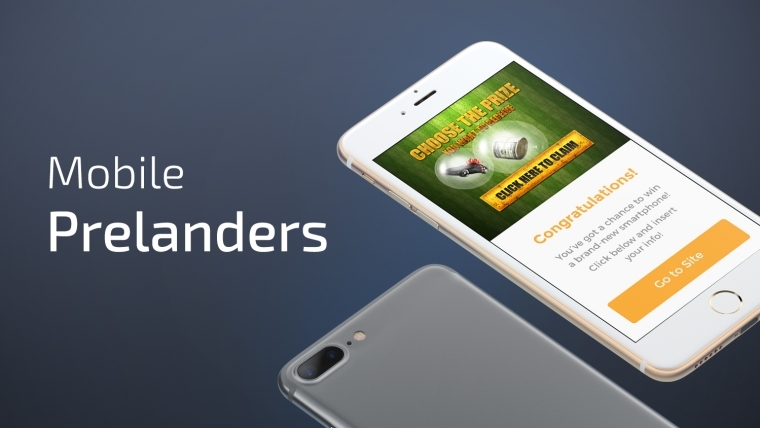 They can come in different forms, but one thing is certain: their purpose is to make the user more engaged and excited about the possibility of winning a free prize. Below, you can see some examples of heavily used pre-landers for sweepstakes. One of the most utilized is the spinning wheel. It basically starts with a pop message explaining you were selected for a prize. What people try to do sometimes is to be as detailed as possible about some key info, such as your device, your operating system or even the date. Image: Dear Chrome user. 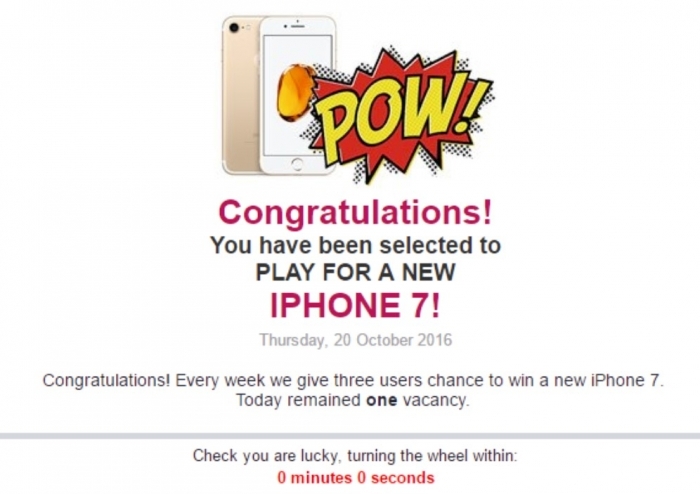 You’re the lucky visitor for today – October 20th 2016. Fill out this questionnaire. We’ll give you the chance to win an iPhone 6, a Nexus 6, or a GalaxyS6! The header pretty much gives you the info and it usually contains a countdown. Then, there’s the spinning wheel. 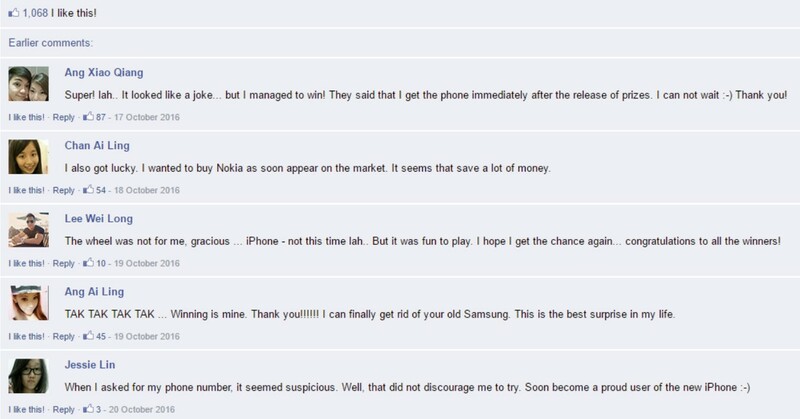 Lastly, there are usually some comments below. They’re written by people that actually “won” the prize. As aforementioned, these pre-landers come in different forms, but the spinning wheel has revealed itself as a recent champion! Let’s move to the next one, shall we? Another widely used type of offer is the so-called performance boosters. Have you been able to spot those “cleaners” that promise to leave your computer faster and better? I’m sure you’ve seen them pop somewhere. The process is similar to the one I’ve alluded to when exploring sweepstakes. Some make an effort to seem more technical and clean. Games! One of the main cores of the electronic industry! Classic, right? Yes, they’ve always been around and I’m pretty sure they always will. Here the pre-landers follow some special, different guidelines. They’re usually very graphical, colourful and have to look even better. Because they have to attract gamers (and sometimes kids). They’ll basically consist of some super slick graphics on the back, with a short message about the game and a clear call to action. Oh, another important factor: the images need to be related to the game and its characters. Bear that in mind and you’ll be good to go! 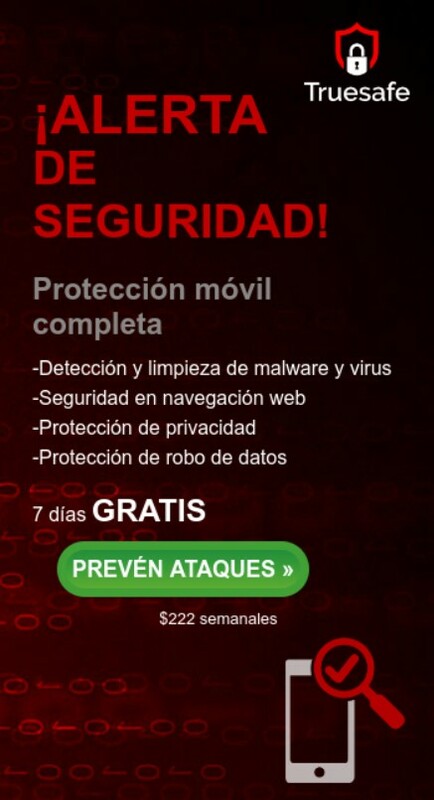 Antivirus. Another cornerstone of computer (and electronic device) history! You didn’t think they’d be forgotten, did you? They’ve been widely promoted in affiliate marketing for quite some time now. Now, their methods are similar to sweeps and especially performance boosters. But, of course, with certain specificities. These landers will normally contain an alert, followed by some nice features the software can provide you. A very clear call to action. Image: SECURITY ALERT! Complete mobile protection! However, it’s very common to find more aggressive advertisement, where the intention is to make the user feel kind of afraid, so that they yearn for the chance of acquiring the antivirus or else something very bad could happen. They’ll basically give you a warning with a countdown, after detecting your device. To make sure you feel the pressure, got it? Then they throw some technical info, some steps and, of course, the clear call to action. 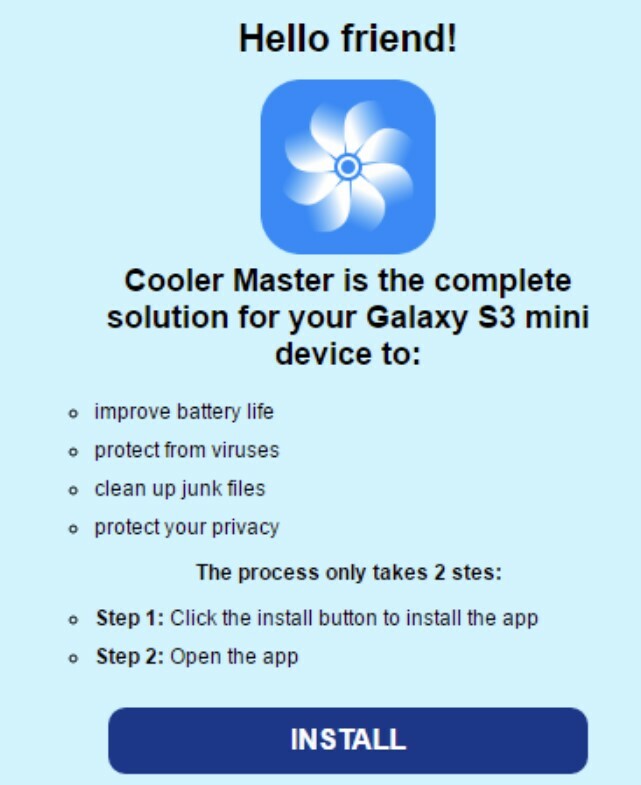 52 viruses…pfff. Looks like my device was in a brothel of Game of Thrones. You can have some variations of this, but the great majority is following this script. 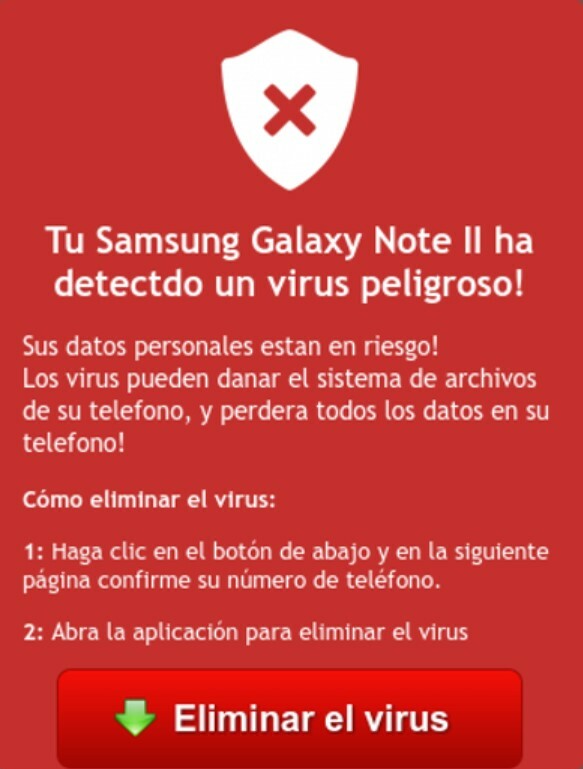 Image: Your Samsung Galaxy Note has detected a dangerous virus! How to eliminate it? Click the “ELIMINATE VIRUS” red button. Dating. We’ve all been there, right? This ancient practice has been all over the internet for quite some time. These offers really need the help of our dear pre-landers. A more “grown up” type of offer, which is mainly aimed at people looking for a serious partner to probably share a life with. They usually follow this pattern. A nice picture of a couple, some more detailed info about the advantages of the service, a clear reference to privacy and safety, and a very clear call to action. Oh, they always mention that there are already thousands of members, and only you are missing all the action. To finish it off, they’ll tell you it’s all FREE. Then, we have a different type of dating offer, which is more focused on a younger audience that just wants to have fun or “have fun”. These will have pictures of beautiful girls, probably partying hard and doing crazy things their mothers can never find out about! There’s also some brief info and – very important – the mention that it’s all FREE. In most cases, these will identify your location. You’ll read something like “meet sweltering hot chicks that live near…” and then of course the sentence is completed with your exact location. Yeah, there’s no such thing as 1392 girls within 5 km that want to spend the night with me (yes, I had a tough life in college). To finish the deal, notice the really obvious, green and flashy call to action! You already know you need to have one of those! Now you can recognize the most widely used pre-landers around. These prelanders can really be a very powerful tool to boost performance. They’re not an easy tool, considering you really have to figure out what truly works or else the effect can be the opposite: ruining your performance. Read a whole lot and put some effort into designing and testing your mobile pre-landers. Make use of all the tools available, especially split testing and A/B testing analysis. Become a pro in this tool and you’ll see your results soar like a golden albatross! That’s it for today, my friends. Hope you liked this article and that it helped you grasp the importance and patterns of mobile pre-landers. Let’s keep those results growing faster than Yao Ming’s physique!